Signaling an end to a trade that still boggles my mind. It has just been annouced, via Bill Shaikin of the LA Times on twitter, that catcher Ramon Hernandez has been released by the Dodgers. #Dodgers officially release C Ramon Hernandez. As you recall, the Dodgers received Hernandez via a trade during Spring Training that sent starting pitcher Aaron Harang to the Rockies. At the time, we were overstocked with starters, so a trade was imminent. I think it's fair to say, though that what we got in return for Harang was less than overwhelming. Hernandez was always just a temporary placeholder and was clearly on the downside of his career. Furthermore, we had Tim Federowicz waiting in the wings, so this particular move looked unnecessary to me. To make matters worse, the Rockies immediately sent Harang to the Mariners for a minor league pitching prospect. They received Steven Hensley, who is currently pitching relief for Colorado's AAA club in Colorado Springs. I am unsure if he is any good, but suffice to say that having a potential arm in the bullpen (even a 26-year old arm) is better than an aging unnecessary catcher. I know I'm way late on this. To start the 2014 Baseball season, the Dodgers and Diamondbacks will sqaure off against each other in Sydney Australia. This will be the first time a MLB game would be played on the continent, but not the first time two Major League clubs have played each other there. In 1914 the White Sox and Giants played an exhibition game there. It will be played at Sydney Cricket Grounds on March 22nd and 23rd. Sydney Cricket Grounds was built in 1848 and is home to the New South Wales Blues cricket team and the Sydney Swans of the Australian Football League. The stadium normally seats 36,000 fans. The photo at the very top is an artist impression of what the field could look like. Photo credit to The Daily Telegraph. Baseball's history in Australia goes back more than 150 years. The 2014 Opening Series will mark the 100th anniversary of exhibition games played by the Chicago White Sox and the New York Giants at the same traditional sports venue where the 2014 Opening Series will be played. The White Sox defeated the Giants, 5-4, before 10,000 fans on January 3, 1914. 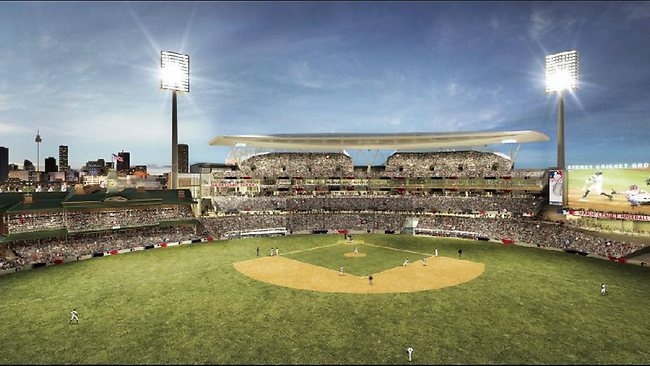 Major League Baseball's history at the Sydney Cricket Ground dates to December 1888, when Spalding's World Tourists played a series of exhibition games, including a December 15, 1888 contest that attracted 5,500 spectators. The Sydney Cricket Ground will be fully renovated to a baseball configuration and Major League standards in order to host MLB's 2014 Opening Series. 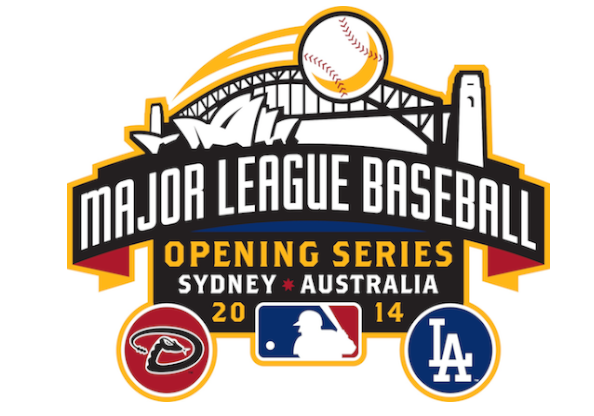 Both the Dodgers and the D-backs will play Spring Training games in Arizona on Sunday, March 16th before departing that evening and arriving in Sydney on the morning of Tuesday, March 18th. 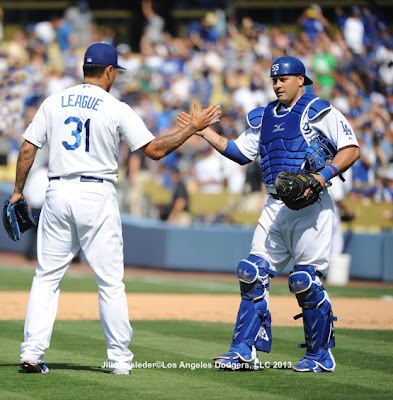 An evening game that will begin Major League Baseball's 2014 regular season will be scheduled for Saturday, March 22nd, followed by an afternoon game on Sunday, March 23rd. The D-backs will be considered the home Club in both games. BTW, there are currently 60 Australians under contract with Major League Baseball clubs. Tickets went on sale this past Wednesday. So, go here if you are interested. Travel packages can be found here. “This is a once in a life time opportunity for fans to experience an American sporting tradition in our own backyard” Opening Series promoter Mr Jason Moore said today. Matt Kemp begins his rehab assignment in Albuquerque today. Hopefully, he'll be with the Dodgers by the end of the week. Photo above, via Jon SooHoo/LA Dodgers 2013. "As Good As It Gets": Vin Scully's Ode To Summer, via Ann Herold at City Think Blog. To me the most interesting moment is at the start of the game at seven o’clock, when it’s still bright enough that the stadium lights haven’t taken effect. You see the back of the mountains, and I always think of “purple mountains’ majesty.” Then there’s the beginning of the sunset, which is right over the left-field stands. I thought we’d have great sunsets when we lived by the ocean, but the way the coastline lies is kind of goofy, and we never saw them. The sky over Dodger Stadium will change into cotton candy—all these different colors. That’s a marvelous thing, when you can sit and take all that in. Bill Shaikin at the LA Times writes, "Dodgers send three scouts to watch Cuban pitching prospect". As outfielder Yasiel Puig attracts attention in the major leagues, the Dodgers joined other major league clubs at a showcase for Cuban right-hander Miguel Alfredo Gonzalez. The 26-year-old right-hander could soon be available to the highest bidder. The 7th edition of Dodgers Playbill features Adrian Gonzalez and is available to fans when entering Dodger Stadium parking gates. 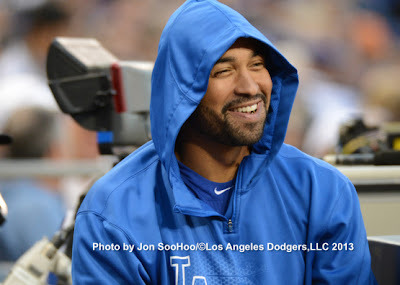 It includes a story on Gonzalez’s first full year in Dodger blue, as well as stories on Yasiel Puig’s meteoric rise, Pedro Guerrero’s historic June 1985 and the Dodgers’ opening the 2014 season in Australia. See it at right. This coming Tuesday is Beach Towel Night and 40,000 beach towels will be given out to fans before the game against the Gaints. See what it loos like on the left. On Tuesday, Bay Area Dodger fan Casey Johnstone whose 5th grade graduation speech has garnered national media attention will throw out the ceremonial first pitch. Casey was asked to give a speech at his Bay Area elementary school about a favorite memory from school and chose to talk about being the only Dodger fan at school while all the kids celebrated the Giants' World Series win. 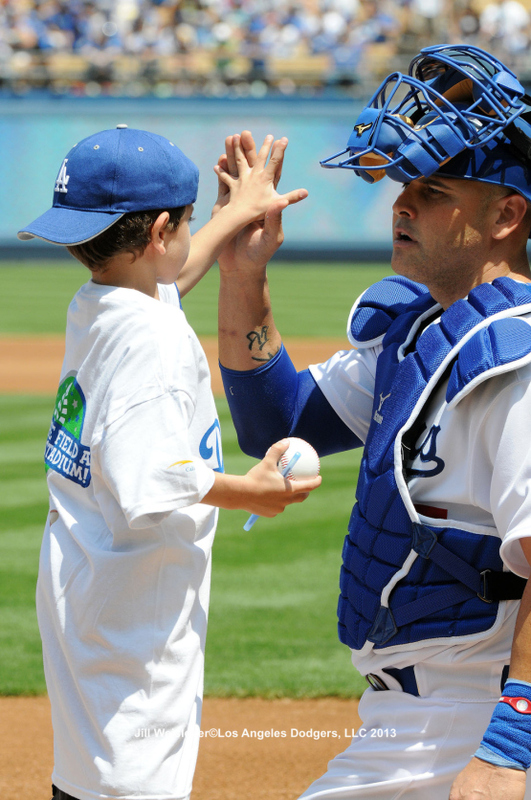 The Dodgers will show Casey’s memorable speech in-game. See the video below. Only in America, Hyun-Jin Ryu!